My husband has been cooking a lot of broccoli florets lately, among the many other vegetable dishes he’s whipped up since immersing himself in the Mediterranean diet. I love how he prepares them (seared in a cast-iron pan with a bit of salt and olive oil), but it means we have a lot of broccoli stems that he has no interest in using. I don’t like wasting any food…especially not broccoli stems, which are so nutritious and versatile. Sometimes I make soup with them (you can follow my zucchini soup recipe here and just use broccoli instead of or in addition to the zucchini) or slice it up and add it to a stir fry, but my favorite thing to do with broccoli stems is grate or chop them up and add to a salad. Fresh broccoli has a much lighter flavor compared with cooked broccoli (parallel to the difference between fresh and cooked carrots or beets). 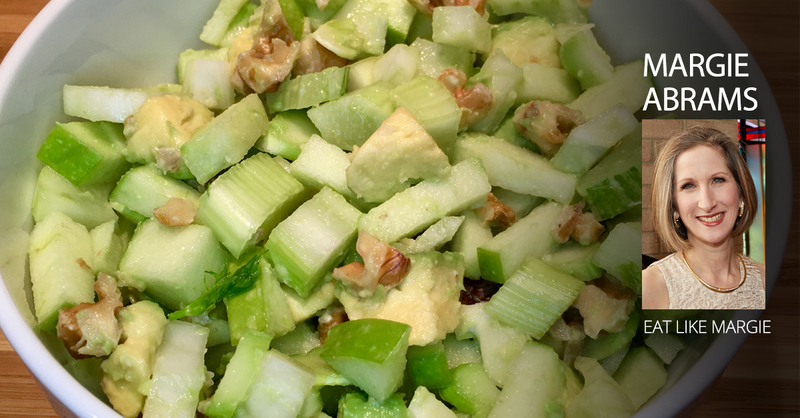 Cut up fennel, broccoli, apple and avocado into bite-sized pieces. 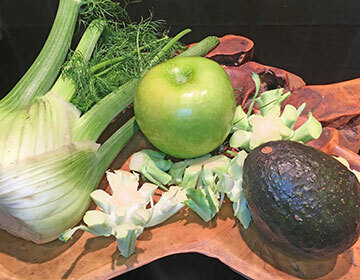 (I use this order to keep the apple and avocado from turning brown.) If the broccoli stems are long, you can grate them. Mix gently (so you don’t mush the avocado) but thoroughly to distribute the lime juice, salt and pepper.